Deaf culture is the set of social beliefs, behaviors, art, literary traditions, history, values, and shared institutions of communities that are influenced by deafness and which use sign languages as the main means of communication. When used as a cultural label especially within the culture, the word deaf is often written with a capital D and referred to as “big D Deaf” in speech and sign. When used as a label for the audiological condition, it is written with a lower case d. Carl G. Croneberg coined the term of “Deaf Culture” and he was the first to discuss analogies between Deaf and hearing cultures in his appendices C/D of the 1965 Dictionary of American Sign Language. Members of the Deaf community tend to view deafness as a difference in human experience rather than a disability or disease. Many members take pride in their Deaf identity. Deaf people, in the sense of a community or culture, can then be seen as a minority group, and therefore some who are a part of this community may feel misunderstood by those who don’t know sign language. Another struggle that the Deaf community often faces is that educational institutions usually consist primarily of hearing people. Additionally, hearing family members may need to learn sign language in order for the deaf person to feel included and supported. Unlike some other cultures, a deaf person may join the community later in life, rather than needing to be born into it. 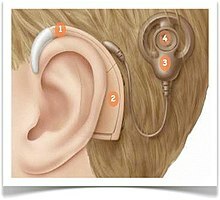 Cochlear Implant – A surgically implanted device used by Deaf and hard-of-hearing people to improve hearing. There are several perspectives on deaf people and Deaf culture that shape their treatment and role in society. From a medical standpoint, many encourage Deaf children to undergo surgery. Especially in the past, the medical perspective discouraged the use of sign language because they believed it would distract from development of auditory and speech skills. From a social standpoint, Deaf individuals are welcomed to participate in society in the same manner as any other individual. This view discourages the idea that those who are deaf or hard-of-hearing are sick and in need of a cure. The social view also encourages making accommodations for deaf people so that they can fully participate in society. Such accommodations include the use of interpreters or improved closed captioning systems. Many feel, however, that the social view fails to recognize the unique qualities of Deaf people and Deaf culture. They believe that this perspective asks Deaf people to fit and find their own way in a predominantly hearing society, instead of recognizing their own abilities and culture. Another perspective is referred to as the cultural-linguistic view. Supporters of Deaf Culture state that this perspective appropriately recognizes Deaf people as a minority culture in the world with their own language and social norms. This standpoint is believed to promote Deaf people’s right to collective space within society to pass on their language and culture to future generations. Being involved in the Deaf community and culturally identifying as Deaf has been shown to significantly contribute to positive self-esteem in Deaf individuals. The community can provide support, easy social interaction, and “refuge from the grinding frustrations of the hearing world.” Conversely, Deaf individuals who are not a part of the Deaf community may not have the same support in the hearing world, resulting in lower self-esteem. Stereotypes, lack of knowledge, and negative attitudes about Deafness cause widespread discrimination. This could lead to a lower education and economic status for deaf people. In 1972, Professor James Woodward, co-director of the Centre for Sign Linguistics and Deaf Studies at the Chinese University of Hong Kong since 2004, proposed a distinction between deafness and the Deaf culture. He suggested using deaf (written with a lower case d) to refer to the audiological condition of deafness, and Deaf (written with an upper case D) to refer to Deaf culture. A U.S. state regulation from the Colorado Department of Human Services defines “Deaf” (uppercase) as “A group of people, with varying hearing acuity, whose primary mode of communication is a visual language (predominantly American Sign Language (ASL) in the United States) and have a shared heritage and culture,” and has a separate definition for “deaf” (lowercase). This convention has been widely adopted within the culture and the scholarly literature in English, and to some extent in other languages. The two terms are also widely used to refer to distinct but partially overlapping groups of people: deaf people (those with significant hearing loss) vs. Deaf people (those who identify with Deaf culture and use a sign language as a primary means of communication). Not everyone makes this distinction, however; some point out that there are many ways to be “deaf” and a simple two-way distinction is too confining. In Deaf culture, person-first language (i.e., “Person who is deaf”, “person who is hard of hearing”) has long been rejected since being culturally Deaf is seen as a source of positive identity and pride. Instead, Deaf culture uses Deaf-first language: “Deaf person” or “hard-of-hearing person”. Capital D -Deaf is as stated prior, is referred to as a student who first identifies as that. Lower case d- deaf is where a person has hearing loss. Typically, those that consider themselves Deaf, first and foremost prior to any other identity. Hearing people may use the term hearing-impaired, perhaps thinking it is more polite than “deaf”, but Deaf people tend to reject it, for a variety of reasons. It is more likely to be used for people with a mild or moderate hearing loss or for people who have acquired deafness in adulthood rather than by those who have grown up Deaf. By contrast, those who identify with the Deaf culture movement typically reject the label hearing-impaired and other labels that imply that deafness is a pathological condition, viewing it instead as a focus of pride. Further, the term focuses entirely on the physical condition of deafness, while ignoring the linguistic and cultural distinction between those who sign and identify with Deaf culture, and those who do not. Various terms once used to refer to the deaf are no longer used and may be viewed either as out-of-date, or an insult, such as deaf-mute, or deaf and dumb. Formerly these terms were neutral, or at least, accepted, as can be seen by nicknames such as baseball player Dummy Hoy, or the former names of educational institutions, since renamed, such as Pennsylvania School for the Deaf (formerly Pennsylvania Institute for the Deaf and Dumb), Gallaudet University (formerly National Deaf-Mute College). Deaf-mute is a literal translation of the French sourd-muet which was already in use in France in the 19th century, in the works of the founder of the deaf school in Paris, as well as in the name of the school, the Institution Nationale des Sourds-Muets à Paris. Since some Deaf people can also speak, the term “deaf-mute” is not accurate. The word “dumb” had meant “speechless” for centuries in English, before it gained the sense of “stupid” as a secondary meaning in the 19th century, but since “stupid” has now become the primary meaning, even though the term is still widely understood in the secondary meaning in the particular expression, the term is now unsuitable to refer to Deaf people. Historically, Deaf culture has often been acquired within schools for Deaf students and within Deaf social clubs, both of which unite deaf people into communities with which they can identify. Becoming Deaf culturally can occur at different times for different people, depending on the circumstances of one’s life. A small proportion of deaf individuals acquire sign language and Deaf culture in infancy from Deaf parents, others acquire it through attendance at schools, and yet others may not be exposed to sign language and Deaf culture until college or a time after that. Although up to fifty percent of deafness has genetic causes, fewer than five percent of deaf people have a deaf parent, so Deaf communities are unusual among cultural groups in that most members do not acquire their cultural identities from parents. Educator and ASL interpreter Anna Mindess notes that there is “not just one homogeneous deaf culture”. There are many distinct Deaf communities around the world, which communicate using different sign languages and exhibit different cultural norms. Deaf identity also intersects with other kinds of cultural identity. Deaf culture intersects with nationality, education, race, ethnicity, gender, class, sexual orientation, and other identity markers, leading to a culture that is at once quite small and also tremendously diverse. The extent to which people identify primarily with their deaf identity rather than their membership in other intersecting cultural groups also varies. Mindess notes a 1989 study, which found that “87 percent of black deaf people polled identified with their black culture first”. Deaf culture is prevalent in schools for the deaf. There are k-12 schools for the deaf throughout the world and the United States, however higher education specifically for the deaf is more limited. Three colleges within the United States are often identified as the best providers of higher education for deaf people. Referred to often as the “Big Three,” these include California State University at Northridge (CSUN), National Technical Institute for the Deaf (part of Rochester Institute of Technology), and Gallaudet University. Gallaudet University is the first and only liberal-arts college for deaf students in the world. Sign languages are an important part of Deaf culture. The American Sign Language (ASL) alphabet is shown here. Members of Deaf cultures communicate via sign languages. There are over 200 distinct sign languages in the world. These include 114 sign languages listed in the Ethnologue database and 157 more sign languages, systems, and dialects. While the United Kingdom and the United States are both predominantly English speaking, the predominant signed languages used in these countries differ markedly. Due to the origins of deaf education in the United States, American Sign Language is most closely related to French Sign Language. Sign language is just one part of deaf culture. Deaf identity is also constructed around specific beliefs, values and art. A positive attitude towards deafness is typical in Deaf cultural groups. Deafness is not generally considered a condition that needs to be fixed. The term “Deaf Gain” is used by Deaf people, to re-frame the deafness to a gain to show how Deaf people do contribute in this world. The use of a sign language is central to Deaf cultural identity. Oralist approaches to educating deaf children thereby pose a threat to the continued existence of Deaf culture. Some members of Deaf communities may also oppose technological innovations like cochlear implants for the same reason. Culturally, Deaf people value the use of natural sign languages that exhibit their own grammatical conventions, such as American Sign Language and British Sign Language, over signed versions of English or other oral languages. Spoken English, written English and signed English are three different symbolic systems for expressing the same language. Deaf communities strongly oppose discrimination against deaf people. Deaf culture in the United States tends to be collectivist rather than individualist; culturally Deaf people value the group. Culturally Deaf people have rules of etiquette for getting attention, walking through signed conversations, leave-taking, and otherwise politely negotiating a signing environment. Deaf people also keep each other informed of what is going on in one’s environment. It is common to provide detailed information when leaving early or arriving late; withholding such information may be considered rude. Deaf people may be more direct or blunt than their hearing counterparts. Deaf people may also consider time differently. Showing up early to large-scale events, such as lectures, is typical. This may be motivated by the need to get a seat that provides the best visual clarity for the Deaf person. Like all other people, Deaf individuals rely on technology for communication significantly. In the United States, video relay services and an array of freestanding and software-driven video phones are often used by deaf people to conduct telephonic communication with hearing and deaf businesses, family and friends. Devices such as the teletype (known as a TTY, an electronic device used for communication over a telephone line) are far less common, but are used by some deaf people who are without access to high-speed Internet or have a preference for these methods for their telephonic communication. Technology is even important in face-to-face social situations. For example, when deaf people meet a hearing person who does not know sign language, they often communicate via the notepad on their cell phones. Here, technology takes the place of a human sense, allowing deaf individuals to successfully communicate with different cultures. Social media tends to be of great importance to deaf individuals. Networking sites allow deaf people to find each other and to remain in contact. Many deaf people have deaf friends throughout the entire country that they met or maintain contact with through online communities. Because the deaf community is so small, for many deaf people, the stigma of meeting others online does not exist. Closed Captioning must be available on a television in order for a deaf person to fully appreciate the audio portion of the broadcast. Conflicts arise when establishments such as restaurants, airlines, or fitness centers fail to accommodate deaf people by turning on Closed Captioning. Movie theaters are increasingly compliant with providing visual access to first-run movies through stand-alone devices, glasses and open caption technology which allow deaf people to attend movies as they are released. Alert systems such as fire alarms and alarm clocks must appeal to different senses in order for a deaf individual to notice the alert. Objects such as vibrating pillows and flashing lights often take the place of the noise-based alarms. Lack of understanding about technological accessibility for the deaf causes conflict and injustice for the deaf community. For example, a significant number of deaf individuals in the UK admit that they are dissatisfied with their banks because of their heavy reliance on telephone banking and lack of assistance to deaf and hard-of-hearing individuals. Architecture that is conducive to signed communication minimizes visual obstructions and may include such things as automatic sliding doors to free up the hands for continuous conversation. A strong tradition of poetry and storytelling exists in American Sign Language and other sign languages. Some prominent performers in the United States include Clayton Valli, Ben Bahan, Ella Mae Lentz, Manny Hernandez, C. J. Jones, Debbie Rennie, Patrick Graybill, Peter Cook, and many others. Their works are now increasingly available on video. Culturally Deaf people have also represented themselves in the dominant written languages of their nations. Deaf artists such as Betty G. Miller and Chuck Baird have produced visual artwork that conveys a Deaf worldview. Douglas Tilden was a famous Deaf sculptor who produced many different sculptures in his lifetime. Some Deaf artists belong to an art movement called De’VIA, which stands for Deaf View Image Art. Organizations such as the Deaf Professional Arts Network or D-PAN are dedicated to promoting professional development and access to the entertainment, visual and media arts fields for individuals who are deaf or hard-of-hearing. Daily Moth was established by Alex Abenchuchan in 2017 to make the news accessible for Deaf ASL users. For detailed deaf history, see Deaf history. In the United States, the Cobbs School, a deaf school in Virginia, was established in 1815. This school lasted only one and half years due to financial setbacks. American Deaf Community recounts the story of Laurent Clerc, a deaf educator, coming to the United States from France in 1817 to help found the first permanent school for deaf children in the country now named American School for the Deaf in Hartford, Connecticut. American School is the first official school for the deaf. Another well-known event is the 1880 Second International Congress on Education of the Deaf in Milan, Italy, where hearing educators voted to embrace oral education and remove sign language from the classroom. This effort resulted in strong opposition within deaf cultures today to the oralist method of teaching deaf children to speak and lip read with limited or no use of sign language in the classroom. The method is intended to make it easier for Deaf children to integrate into hearing communities, but the benefits of learning in such an environment are disputed. The use of sign language is central to Deaf identity, and attempts to limit its use are viewed as an attack. Deaf culture revolves around such institutions as residential schools for deaf students, universities for deaf students (including Gallaudet University, South West Collegiate Institute for the Deaf, and the National Technical Institute for the Deaf), deaf clubs, deaf athletic leagues, communal homes (such as The Home for Aged and Infirm Deaf-Mutes, founded by Jane Middleton, in New York City), deaf social organizations (such as the Deaf Professional Happy Hour), deaf religious groups, deaf theaters, and an array of conferences and festivals, such as the Deaf Way II Conference and Festival and the World Federation of the Deaf conferences. Deaf clubs, popular in the 1940s and 1950s, were also an important part of deaf culture. During this time there were very few places that the deaf could call their own– places run by deaf people for deaf people. Deaf clubs were the solution to this need. Money was made by selling alcohol and hosting card games. Sometimes these ventures were so successful that the building used by the club was able to be purchased. However, the main attraction of these clubs was that they provided a place that deaf people could go to be around other deaf people, sometimes sharing stories, hosting parties, comedians, and plays. Many of today’s common ABC stories were first seen at deaf clubs. The clubs were found in all of the major cities, New York City being home to at least 12. These clubs were an important break from their usually solitary day spent at factory jobs. In the 1960s, deaf clubs began their quick and drastic decline. Today there are only a few spread-out deaf clubs found in the United States and their attendance is commonly small with a tendency to the elderly. This sudden decline is often attributed to the rise of technology like the TTY and closed captioning for personal TVs. With other options available for entertainment and communication, the need for deaf clubs grew smaller. It was no longer the only option for getting in touch with other members of the deaf community. However, others attribute the decline of deaf clubs to the end of World War II and a change in the job market. During WWII there was high demand for factory laborers and a promise of high pay. Many deaf Americans left their homes to move to bigger cities with the hope of obtaining a factory job. This huge influx of workers into new cities created the need for deaf clubs. When World War II ended and the civil rights movement progressed, the federal government started offering more jobs to deaf men and women. People began switching from manufacturing jobs to service jobs, moving away from solitary work with set hours. Today, deaf clubs are rare, but deaf advocacy centers and other deaf organizations have become widespread and popular. The Rainbow Alliance of the Deaf is a nonprofit established in 1977 to, “establish and maintain a society of Deaf GLBT to encourage and promote the educational, economical, and social welfare; to foster fellowship; to defend our rights; and advance our interests as Deaf GLBT citizens concerning social justice; to build up an organization in which all worthy members may participate in the discussion of practical problems and solutions related to their social welfare. RAD has over twenty chapters in the United States and Canada.” There is also the American deaf resource center Deaf Queer Resource Center (DQRC), the Hong Kong Bauhinias Deaf Club, and the Greenbow LGBT Society of Ireland. There are 15 chapters of Deaf Women United throughout the United States; its mission is, “to promote the lives of Deaf women through empowerment, enrichment, and networking.” There is also Pink Wings of Hope, an American breast cancer support group for deaf and hard-of-hearing women. Deaf people at the library have the same needs as other library patrons, but they often have more difficulty accessing materials and services. Over the last few decades, libraries in the United States have begun to implement services and collections for Deaf patrons and are working harder every year to make more of their collections, services, their communities, and even the world more accessible. The American Library Association considers disabled people, including the Deaf, as a minority that is often overlooked by library staff. However, in the last few decades, libraries across the United States have made improvements in library accessibility in general and to the Deaf community specifically. One of the first activists in the library community working toward accessibility for the Deaf was Alice Hagemeyer. When disabled communities began demanding equality in the 1970s, Hagemeyer decided to go back to school for her master’s degree in library science. While she was studying there, she realized that there was not very much information about the Deaf community at her library or at the libraries of any of her classmates. She soon became an activist for Deaf awareness at her library, and she became the first “Librarian for the Deaf Community” from any public library in the nation. Hagemeyer also constructed a manual of resources for Deaf people and those associated with them called The Red Notebook. This notebook is now an online resource, which is available at the website of the Friends of Libraries for Deaf Action. Hagemeyer was one of the first library activists to make strides for the Deaf community. Australian librarian Karen McQuigg states that “even ten years ago, when I was involved in a project looking at what public libraries could offer the deaf, it seemed as if the gap between the requirements of this group and what public libraries could offer was too great for public libraries to be able to serve them effectively.” There was a dearth of information for or about the Deaf community available in libraries across the nation and around the globe. New guidelines from library organizations such as International Federation of Library Associations and Institutions (IFLA) and the ALA were written in order to help libraries make their information more accessible to people with disabilities, and in some cases, specifically the Deaf community. IFLA’s Guidelines for Library Services to Deaf People is one such set of guidelines, and it was published to inform libraries of the services that should be provided for Deaf patrons. Most of the guidelines pertain to ensuring that Deaf patrons have equal access to all available library services. Other guidelines include training library staff to provide services for the Deaf community, availability of text telephones or TTYs not only to assist patrons with reference questions but also for making outside calls, using the most recent technology in order to communicate more effectively with Deaf patrons, including closed captioning services for any television services, and developing a collection that would interest the members of the Deaf community. Over the years, library services have begun to evolve in order to accommodate the needs and desires of local Deaf communities. At the Queens Borough Public Library (QBPL) in New York, the staff implemented new and innovative ideas in order to involve the community and library staff with the Deaf people in their community. The QBPL hired a deaf librarian, Lori Stambler, to train the library staff about Deaf culture, to teach sign language classes for family members and people who are involved with deaf people, and to teach literacy classes for Deaf patrons. In working with the library, Stambler was able to help the community reach out to its deaf neighbors, and helped other deaf people become more active in their outside community. The library at Gallaudet University, the only Deaf liberal arts university in the United States, was founded in 1876. The library’s collection has grown from a small number of reference books to the world’s largest collection of deaf-related materials with over 234,000 books and thousands of other materials in different formats. The collection is so large that the library had to create a hybrid classification system based on the Dewey Decimal Classification System in order to make cataloging and location within the library much easier for both library staff and users. The library also houses the university’s archives, which holds some of the oldest deaf-related books and documents in the world. In Nashville, Tennessee, Sandy Cohen manages the Library Services for the Deaf and Hard of Hearing (LSDHH). The program was created in 1979 in response to information accessibility issues for the Deaf in the Nashville area. Originally, the only service provided was the news via a teletypewriter or TTY, but today, the program has expanded to serving the entire state of Tennessee by providing all different types of information and material on deafness, Deaf culture, and information for family members of Deaf people, as well as a historical and reference collection. ^ a b Padden, Carol A.; Humphries, Tom (Tom L.) (2005). Inside Deaf Culture. Cambridge, MA: Harvard University Press. p. 1. ISBN 978-0-674-01506-7. ^ a b Jamie Berke (February 9, 2010). “Deaf Culture – Big D Small D”. About.com. Retrieved November 22, 2013. ^ a b c d Ladd, Paddy (2003). Understanding Deaf Culture: In Search of Deafhood. Multilingual Matters. p. 502. ISBN 978-1-85359-545-5. ^ Lane, Harlan L.; Richard Pillard; Ulf Hedberg (2011). The People of the Eye: Deaf Ethnicity and Ancestry. Oxford University Press. p. 269. ISBN 978-0-19-975929-3. ^ James, Susan Donaldson; Huang, Grace (December 13, 2006). “Deaf and Proud to Use Sign Language”. ABC News. Retrieved August 31, 2015. ^ Nash, Jeffrey E.; Nash, Anedith (1981). Deafness in Society. Toronto: LexingtonBooks. pp. 100–102. ^ a b Hamill, Alexis C., and Catherine H. Stein. “Culture and Empowerment in the Deaf Community:	An Analysis of Internet Weblogs.” Journal of Community & Applied Social Psychology,	vol. 21, no. 5, 2011, pp. 388–406., doi:10.1002/casp.1081. ^ Roots, James (1999). Politics of Visual Language: Deafness, Language Choice, and Political Socialization. McGill-Queen’s University Press. pp. 1–6. ^ a b Padden, Carol; Humphries, Tom (1988). Deaf in America: Voices from a Culture. Harvard University Press. p. 134. ISBN 978-0-674-19423-6. ^ a b c d e f g h i Mindess, Anna (2006). Reading Between the Signs: Intercultural Communication for Sign Language Interpreters. ISBN 978-1-931930-26-0. ^ Baker, Charlotte; Carol Padden (1978). American Sign Language: A look at its story, structure and community. ^ “James Woodward biography”. Deaf Dialogue. August 24, 2010. Archived from the original on December 3, 2013. Retrieved November 22, 2013. ^ “RULE MANUAL 27 COLORADO COMMISSION FOR THE DEAF AND HARD OF HEARING”. Colorado Secretary of State. May 1, 2010. p. 15. Retrieved September 26, 2015. ^ “‘Big D’ and ‘Small d’ in the Deaf Community”. Verywell Health. Retrieved March 8, 2018. ^ Lum, Doman (2010). Culturally Competent Practice: A Framework for Understanding. Cengage Learning. p. 441. ISBN 9780840034434. ^ “Terminology Describing Deaf Individuals”. Gallaudet University. Archived from the original on June 5, 2013. Retrieved June 29, 2013. ^ a b “Community and Culture – Frequently Asked Questions – Question – What is wrong with the use of these terms ‘deaf-mute,’ ‘deaf and dumb,’ or ‘hearing-impaired’?”. National Association of the Deaf. Archived from the original on December 27, 2015. Retrieved December 29, 2015. ^ O’Conner, Patricia; Kellerman, Stewart (July 3, 2014). “The Grammarphobia Blog – Speaking of dumb”. Archived from the original on September 5, 2015. Retrieved December 29, 2015. ^ Mitchell, Ross E. & Karchmer, Michael A. (2004) Chasing the mythical ten percent: Parental hearing status of deaf and hard of hearing students in the United States. Sign Language Studies 4:2, 138–163. ^ a b c d Bauman, Dirksen (2008). Open your eyes: Deaf studies talking. University of Minnesota Press. ISBN 978-0-8166-4619-7. ^ Christiansen, John B. “Sociological Implications of Hearing Loss.” Annals of the New York Academy of Sciences, vol. 630, no. 1 Genetics of H, 1991, pp. 230–235.,doi:10.1111/j.1749-6632.1991.tb19592.x. ^ Padden, Carol, and Tom Humphries. Deaf in America: Voices from a Culture. Harvard University Press, 2003. ^ “Who We Are”. Gallaudet University. Retrieved November 29, 2018. ^ Tay, Phoebe. “Deaf Education Programs around the World”. Retrieved November 29, 2018. ^ Harrington, Thomas. “Sign language of the world by name”. Galllaudet University Library. Retrieved July 24, 2012. ^ Harrington, Thomas. “Sign language of the world by name.” n. page. Print. ^ Gannon, Jack R (1981). Deaf Heritage–A Narrative History of Deaf America. Silver Spring, MD: National Association of the Deaf. p. 378. ISBN 978-0-913072-38-7. ^ Rood, Rachel (May 12, 2013). “New Closed-Captioning Glasses Help Deaf Go Out to the Movies : All Tech Considered”. NPR. Retrieved April 12, 2015. ^ “Banks face massive payouts to deaf customers”. Action on Hearing Loss / RNID. February 21, 2012. Archived from the original on June 4, 2013. Retrieved April 12, 2015. ^ Tsymbal, Karina (2010). Deaf Space and the Visual World – Buildings That Speak: An Elementary School For The Deaf (MArch). University of Maryland. hdl:1903/11295. ^ a b Krentz, Christopher (2000). A Mighty Change: An Anthology of Deaf American Writing 1816–1864. Gallaudet University Press. ISBN 978-1-56368-101-1. ^ Sonnenstrahl, Deborah (2002). Deaf Artists in America: Colonial to Contemporary. DawnSignPress. ISBN 978-1-58121-050-7. ^ “Douglas Tilden facts and information”. Deafness.answers.com. Archived from the original on April 4, 2015. Retrieved April 17, 2015. ^ “Ability Magazine: Sean Forbes – Not Hard to Hear” (2011)”. Abilitymagazine.com. Retrieved April 4, 2012. ^ “thedailymoth”. thedailymoth. Retrieved March 8, 2018. ^ “Through Deaf Eyes . Deaf Life . 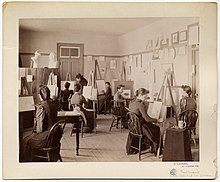 The First Permanent School | PBS”. www.pbs.org. Retrieved March 8, 2018. ^ Baynton, Douglas (1996). Forbidden Signs: American Culture and the Campaign against Sign Language. University of Chicago Press. ISBN 978-0-226-03964-0. ^ “About Us”. National Black Deaf Advocates. Retrieved April 12, 2015. ^ “Purpose”. Rainbow Alliance of the Deaf. Retrieved September 26, 2015. ^ Gianoulis, Tina. “Deaf Culture” (PDF). glbtq archive. Retrieved September 26, 2015. ^ “Other LGBT Organisations”. LGBT Diversity. Archived from the original on April 8, 2015. Retrieved April 12, 2015. ^ “Hebrew Seminary – A Rabbinical School for Deaf and Hearing”. Retrieved April 12, 2015. ^ Albrecht, Gary L., ed. (2006). “Judaism”. Encyclopedia of Disability Volume 5. Sage Publications. pp. 997–998. ISBN 978-0-7619-2565-1. Retrieved April 12, 2015. ^ “Churches for Deaf”. Ohsoez.com. Retrieved April 12, 2015. ^ DeFiglio, Pam. “Hebrew Seminary of the Deaf”. Patch. Archived from the original on September 11, 2013. ^ Tomchin, Susan (April 2012). “Hearing the Needs of the Jewish Deaf”. Jewish Women International. Archived from the original on September 28, 2015. Retrieved September 26, 2015. ^ Laird, Grant, Jr. (June 20, 2011). “JDRC Salutes Conservative Judaism’s Ruling to Include Deaf Jews as Equals | Deaf Network of Texas”. Deafnetwork.com. Retrieved April 12, 2015. ^ “About Us”. Deaf Women United. Retrieved September 26, 2015. ^ “Pink Wings of Hope”. DEAF, Inc. October 11, 2009. Retrieved September 26, 2015. ^ “Library Services for People with Disabilities Policy | Association of Specialized & Cooperative Library Agencies (ASCLA)”. Ala.org. January 16, 2001. Retrieved April 17, 2015. ^ Hagemeyer, A. L. (2001). Achievement: From a lack of knowledge to an appreciation of Deaf history. IFLA Conference Proceedings, 1–3. ^ McQuigg, Karen (August 2003). “Are the deaf a disabled group, or a linguistic minority? Issues for librarians in Victoria’s public libraries”. Australian Library Journal. 52 (4). Archived from the original on May 31, 2004. ^ Day, J. M. (2000). Guidelines for library services to deaf people (Report no. 62). The Hague: International Federation of Library Associations and Institutions. ^ Hollander, P. (1995). Deaf-advocacy at Queens Borough PL. American Libraries, 26(6), 560–562. ^ Cohen, S. (2006). Have you heard about the Library Services for the Deaf & Hard of Hearing? Tennessee Libraries, 56(1), 51–56. Berbrier, Mitch. “Being Deaf has little to do with one’s ears”: Boundary work in the Deaf culture movement. Perspectives on Social Problems, 10, 79–100. Ladd, P. (2003). Understanding Deaf Culture. In Search of Deafhood, Toronto: Multilingual Matters. Lane, Harlan (1993). The Mask of Benevolence, New York: Random House. Lane, Harlan. (1984) When the Mind Hears: A History of the Deaf, New York: Vintage. Lane, Harlan, Hoffmeister, Robert, & Bahan, Ben (1996). A Journey into the Deaf-World, San Diego, CA: DawnSignPress. Leigh, Irene W., Andrews, Jean F, & Harris, Raychelle L. (2016). Deaf Culture: Exploring Deaf Communities in the United States, San Diego, CA: Plural Publishing, Inc.
Luczak, Raymond (1993). Eyes of Desire: A Deaf Gay & Lesbian Reader. Moore, Matthew S. & Levitan, Linda (2003). For Hearing People Only, Answers to Some of the Most Commonly Asked Questions About the Deaf Community, its Culture, and the “Deaf Reality”, Rochester, New York: Deaf Life Press. Padden, Carol A. (1980). The deaf community and the culture of Deaf people. In: C. Baker & R. Battison (eds.) Sign Language and the Deaf Community, Silver Spring(EEUU): National Association of the Deaf. Padden, Carol A. & Humphries, Tom L. (1988). Deaf in America: Voices from a Culture, Cambridge, MA: Harvard University Press. Padden, Carol A. & Humphries, Tom L. (2005). Inside Deaf Culture, ISBN 978-0-674-01506-7. Sacks, Oliver W. (1989). Seeing Voices: A Journey Into The World Of The Deaf, ISBN 978-0-520-06083-8. Spradley, Thomas and Spradley, James (1985). Deaf Like Me, Gallaudet University Press, ISBN 978-0-930323-11-0. Van Cleve, John Vickrey & Crouch, Barry A. (1989). A Place of Their Own: Creating the Deaf Community in America, ISBN 978-0-930323-49-3. Deafness as Culture. Article by Edward Dolnick in the Atlantic Monthly, September 1993. “Deafness is not a disability” (argumentum ad consequentiam) Article discussing the controversy. The Silent Worker – a popular national newspaper among the deaf population of the United States during the end of the 1890s through the end of the first quarter of the 20th century. National Association of the Deaf. The NAD protects deaf and hard of hearing civil rights in the U.S.